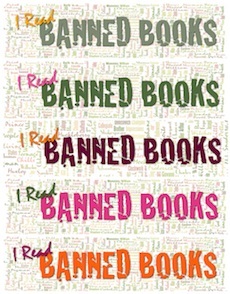 It’s hard to believe that Banned Books Month has rolled around again. Officially, the celebration is supposed to last only one week, this year from September 22-28. The American Library Association uses this time to draw attention to the importance of making sure that books with unorthodox or unpopular viewpoints are available to those who wish to read them. As in previous years, I like the idea so much that I’m celebrating banned books in this column for four weeks instead of just one. The list of Ten Most Frequently Challenged Books for 2012 contains some old standbys and a few new titles. Those books, in descending order, are the “Captain Underpants” series by Dav Pilkey, “The Absolutely True Diary of a Part-Time Indian” by Sherman Alexie, “Thirteen Reasons Why” by Jay Asher, “Fifty Shades of Grey” by E.L. James, “And Tango Makes Three” by Justin Richardson and Peter Parnell, “The Kite Runner” by Khaled Hosseini, “Looking for Alaska” by John Green, “Scary Stories” by Alvin Schwartz, “The Glass Castle” by Jeannette Walls and “Beloved” by Toni Morrison. Figuring that we might as well start at the top, I recently read “Captain Underpants and the Revolting Revenge of the Radioactive Robo-Boxers,” the tenth book in Pilkey’s perennially-popular series. I found the latest book, like all its predecessors, ridiculously silly. Not to mention boring. And confusing. I agree with critics who think Pilkey does his readers a disservice by misspelling certain words in the way fourth graders might spell them. For example, our protagonists George and Harold “hipnitize” their “rilly” mean “principle” Mr. Krup and make him “beleave” he’s the superhero Captain Underpants. Pilkey intentionally uses bad grammar for the same reason. His books are mindless entertainment. Junk food. Largely void of literary merit. That’s why the ALA’s Office of Intellectual Freedom has celebrated Banned Books Week every year since 1982. And why I will continue to read and write about controversial books throughout the month of September.